Let’s get right down to it — another skating season has arrived. We’re past the Senior B events. We’ve seen the Japan Open. Some of the top skaters have had the chance to put their programs on competition ice for the first time, others will soon have that chance. But the time for planning and preparation is nearly over; it’s time to get this party started! There are always significant storylines in the season opener … this year is no different. There is little doubt that Ashley Wagner comes into this event as the favorite. And after what she showed at the Japan Open, there’s good reason for that. I recently compared the debut of her new Free Skate to a Michelle Kwan season debut — it’s been a long time since I’ve seen a skater put out a program for the first time and look so ready, so confident … and rightfully so. Last season did this girl good in more ways than one. Last year, she proved something to herself. Now, she’s out to prove it to the rest of the world. Her biggest competition will likely come from the Russians — World Silver Medalist Alena Leonova and 2011 World Junior Champion Adelina Sotnikova. Leonova, too, competed at the Japan Open. She was not nearly as “big stage” ready as Wagner. Granted, both girls competed Free Skates only, but Leonova’s 107+ was no match for Wagner’s 123+. Still, we saw last year that she is capable of taking advantage of the mistakes of others, as well as hitting big, beautiful jumps that rack up those points. Sotnikova, on the other hand, is already a three-time Russian champion … and yet, is in her first season where she is age-eligible for Worlds. Last year — her first on the Senior Grand Prix circuit — she took home two medals. She, too, opened her season early — at Nebelhorn Trophy — where she finished a somewhat disappointing second. Haruka Imai has already had one magical moment this season — rebounding from 9th in the Short Program at Nebelhorn to 3rd overall. I’ve been waiting for Imai to have a breakout season. She has some truly beautiful moments in her programs, and when she lands the jumps, they, too, area beautiful. Perhaps this is the year. Viktoria Helgesson took third in this event last season. She followed that with a fifth-place finish at Trophee Eric Bompard. There’s just something about her that makes me close my eyes and imagine that she’s skating inside a snowglobe. She’s stunning. Sometimes, though, stunning doesn’t come with clean triple jumps. Don’t forget about the other American girls in this event! Both Christina Gao and Rachael Flatt have the fire power to make a move here. Gao is in her second season as a senior — this time, making the decision to juggle a Harvard education and skating all at once. Flatt understands that struggle, as a sophomore at Stanford. But, both have committed to continue training. And both are looking to rebound from disappointing — and at times injury riddled — seasons last year. In the last few Olympic cycles, I have to say the men’s competition has been even more drama-filled than the ladies’. Story after story, comeback after catastrophe, dual top-billings throughout the year … I love it! Last year, Skate America was, for lack of a gentler term, kind of a splat fest. Often, that’s what we see in the first event out. However, the names this week are enough to keep me hoping for some fireworks, even in the opening event. With Evan Lysacek pulling out with an injury (he’s been replaced by Armin Mahbanoozadeh), Jeremy Abbott stands alone as the top US man in Washington. I have to say, I am very much looking forward to his programs this season … but, I’m also curious to see how he comes back from a disappointing World Championships. And, if he has the quad ready to go. You know who does have a quad ready to go? Michal Brezina. And Yuzuru Hanyu. Um, and Takahiko Kozuka. Brezina is the reigning Champion at this event after shocking most everyone but himself by holding on to the win last year. But, he struggled to hold onto that consistency, falling to 6th by Worlds. 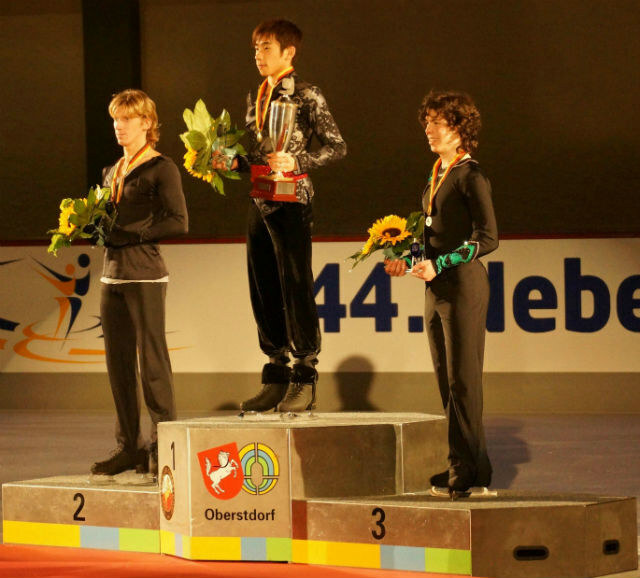 At Nebelhorn, he was fifth with a score that didn’t seem to hint at a return trip to the top of the Skate America podium. Hanyu started his season at Finlandia Trophy where he overcame a rough Short Program to overtake Javier Fernandez in the Free Skate for gold. He was helped by a pair of quads and a pair of triple axels. Takahiko Kozuka finished third at Skate America last season. He is a skater who seems to have all the pieces, but not all at once. There could be an interesting battle beginning between Kozuka and Hanyu — not just at SA, but for the remainder of the season. Don’t forget Tomas Verner, though his more recent skates haven’t been quite up to his best. He has a beautiful quad toe that could put him in contention. More on the Pairs and Dance teams tomorrow! And, a little bit of special news on Thursday. Just a few short weeks ago, we were all bouncing off the walls with excitement as the Grand Prix series got underway. And now? It’s just about over. I won’t lie…I’m even a little bit exhausted keeping up with it all! It’s a trip just trying to watch as much as possible via icenetwork between work schedules (and, perhaps more importantly, sleep schedules! )…I can only imagine the skaters are feeling the cries for rest as well. But with just one more weekend to determine Grand Prix Final line ups, there’s no rest for the weary! Trophy Eric Bombard (um…can I say I miss “Lalique?”) might have the weakest ice dance field thus far. The only “big name” team is the hometeam – French skaters Pechalat and Bourzat. They’re the obvious favorites here, and barring some crazy circumstances like last weekend, this is their time to shine. Madison Chock and Greg Zuerlein from the US will be hoping to one-up their bronze medal from Canada. Several other teams are coming off of 5th place finishes in their first GP events, so they’ll be battling it out to move up to podium position here. The pairs event features Savchenko and Szolkowy from Germany who won Skate America quite easily. They are also the odds-on favorites in France, and should really only face competition from one team – Bazarova and Larionov from Russia who placed 2nd at NHK Trophy at the start of the season. However, they placed 2nd with a score of 173.83 and S/S of Germany won Skate Canada with a score of 197.70. So there still should be no contest for gold. If the Russians hang on for silver, there will be a trio of young teams looking to improve from their earlier assignments: Felicia Zhang and Taylor Toth (USA), Mylene Brodeur and John Mattatall (CAN), and Maylin Hausch and Daniel Wende (GER). All three finished 6th or 7th at their respective first events and have a shot at the podium here. The ladies event remains as unpredictable as any thus far. We’ve got Mao Asada trying to make a comeback from a disastrous season debut and Alissa Czisny trying to repeat in her own comeback season of sorts…and that’s just the beginning. Cynthia Phaneuf of Canada will be looking to make amends for her long program meltdown that kept her from winning at home, Haruka Imai of Japan will try to desperately keep her GPF hopes alive, and Mirai Nagasu will look to be more trained in her long program, as well as fighting off the demons that haunt her free skate, should she win the short program. I refuse to make any sort of predictions, because the only thing predictable about the ladies events this year is that there’s no possible way to make an educated guess about what will happen! On the men’s side, however, we once again see likely the best competition of the event. France’s Brian Joubert is looking for more than just clean quads after even his new-and-much-improved choreography and style left him 4th in China. Kevin Reynolds of Canada will look to repeat his stellar 2-quad short program, but better his own 4th place finish from Canada. Japan’s Takahiko Kozuka comes in as the best candidate for “the favorite” after winning Cup of China, defeating Brian Joubert and the American Brandon Mroz. Mroz, as well as the other Frenchman Florent Amodio, are both hoping for Grand Prix miracles after medaling in their early events. The best part is, on any given day, any one of these guys could throw down back-to-back performances that can’t be beat. The question is…who’s day will it be? This will determine who’s in and who’s out. And as anxious as the competitors in France will be, some (like Jeremy Abbott) who are already done will be just as anxious waiting at home to see if they did enough to book a trip to Beijing! Due to the Thanksgiving holiday, I may or may not be able to tweet live this weekend. It all depends on the family activities! But regardless, I’ll be checking in and posting my thoughts throughout. I just read an “open letter” from Plushenko about how he should be reinstated by the ISU. (If you didn’t know, he was banned for competing in a non-sanctioned event that coincided with Worlds, I believe.) As much as there is a part of me that feels sorry for him, it’s only a very small piece. I had a hard time digesting his actions and comments post-Vancouver, and even if he was upset, physically and emotionally hurt, he was wrong to react as he did. Then to go out and compete in an event he knew wasn’t approved (this isn’t his first rodeo, kids…he’s been around long enough he should have known better), fail to submit his appeal by the required deadline, wait several months, then make claims like “You haven’t seen the last of me” and “I will compete in Sochi”…I’m sorry, but rules are in place for a reason. And, fair or not, he violated them. Just because he’s Russia’s star doesn’t mean he should get special permission to get around the rules. …just my thoughts.